Click the People tab. By default, the Users tab on this page will be selected. Click the Add users link. Enter one or more email address for the user(s) you would like to add to your account, using a comma to separate addresses. Optionally, add your user(s) to one or more Group by checking the box corresponding to each Group to which you'd like to add your new user(s). 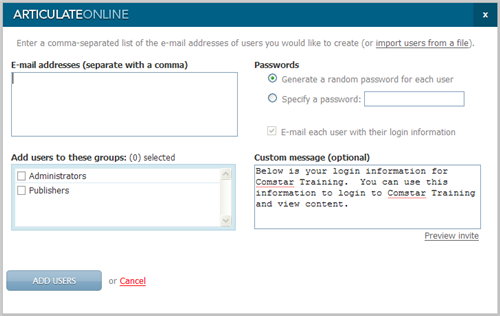 Choose whether to Generate a random password for each user or to Specify a password for the new user(s). Note that if you select the latter option (specify a password) all new users will be assigned the same password. If you selected the option to specify a password, you can then specify if you want Articulate Online toE-mail each user with their login information. Optionally, create or edit a Custom message that your new user(s) will receive. Click the Add Users button to add your new user(s). Articulate Online will automatically send an email to your user(s) unless you have chosen to specify a password and not notify the user(s). If you need to add additional users to your account beyond the number of available users in your current plan, you can upgrade your Articulate Online plan (we're happy to customize plans to meet your specific requirements). You can check your current user usage at any time by clicking on the Settings tab and looking at the details provided in the Your Articulate Online Plan box. Tip: You can also bulk import new users into Articulate Online. Imported users won't receive automatic email notifications, so you'll need to notify them separately.